2014 is almost over and I think about what have I accomplished and how much fun I have had. I have some great friendships that are continuing to form; and am learning new things. Here is a recap of 2014 projects most of which you will find the full story on the blog – NOTE: Some are still UNFINISHED PROJECTS !! January – cleaning up the chaos in the sewing room and sorting the scraps; arranging my containers and playing with hexi’s. The shelving unit the bins belong on; the batting is out of control and will get resolved another day! The scrap table…this is to the right of my cutting table; buried under piles of Stuff; seems a good place to toss the pants that need mended; the fusable bin; and the 3 or 4 stacks of fabric for future projects !! YIKES …and this is why I am working on sorting!!! February brought a guild retreat where we did a “summer in the park” and a “one block wonder”. Both end 2014 as works in progress. Summer in the park – In the midst of stitching row 2 to row 3….Row one awaits on the wall. March brought snow and daffodils; and string piecing blocks for the Guild President Quilt, more work on my Summer in the park, my Lisa bag and the beginnings of a memory quilt from t-shirts for my friend Karen. It also brought a surprise in the mail from AVIS ! I also took a trip to the Lancaster Quilt show. April saw the finish & delivery of the t-shirt memory quilt; a 5 minute table runner and the Celebrate/Happy birthday bunting. There was a great sit & sew with 3 quilt bees for 3 days where the table runner was the focus. May brought Guild “sewing with silk” class; and a 2014 UFO finish of my 9 patch cupcake quilt that has been hanging around since 2012. Worked on a charity baby quilt in flannel for our bee; bound senior quilts with flanged binding; recycled leftover binding into fun hexi’s and made a baptismal banner for my granddaughter. (Lessons from the silk class and stabilizing fabric were very helpful!) There was also a trip to a quilt show at the Dulles Expo Center. 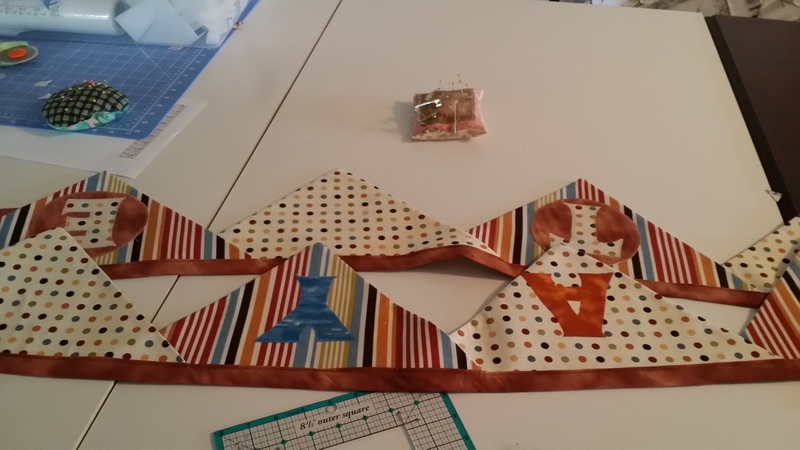 June – Another guild class and a FINISH. Class was Bill Kerr teaching his SNOWDRIFT pattern, using a curved template. I called mine FLOWERS in the Snow. I did 2 blocks for Ebony Love designers challenge, and watched the flowers bloom in the garden. I made a BEATLE BAG for my sewing supplies and we fixed the webbing under the sofa! Love the feathery blooms of the Astilbe. Snipped this one in error, so I brought it in the house. July— brought fun in the pool and fun in the mail. I won a Funky Chicken pin cushion; and then made 6 more; using log cabin blocks. My chickens were Blue Hens! I also fixed the hubby’s POOL chair, new fabric in a bright cheery color. I spent most of the time working on scheduling speakers / instructors for the next 2 years for our quilt guild; having been elected to serve as Vice President/Programs. LOTS of meetings over the summer. August— I took another guild class and made the Crusty crab. The crab STILL needs binding! I worked on 6 flannel baby quilts for our bee; quilting and binding tops that others had pieced; and made birthday gifts for a 2 year old! And then I went to California for nearly 3 weeks! six flannel baby quilts ready to go. September I spent Labor Day in California; finishing up a painting projects for my sister -and then the SECRET PROJECT was started; a quilt for my sister to go in the purple bedroom! I left a few UFO’s in California; the doors needed to be rehung and the hallway needed 1 more coat, and the door trim need to be done…..ran out of time….ooops. Sister in charge of the built-ins. October– The grandkids and parents came to visit from Congo! We had fun together playing! We collected 3 suitcases full of school supplies for them to take back to a local school. Of course there were the monthly Quilt guild meetings, the Material Girls Quilt bee, and a 3 day sit & sew at the end of the month. I had so many extra strips from the SECRET PROJECT, I decided to make ANOTHER log cabin for my sister’s great granddaughter. 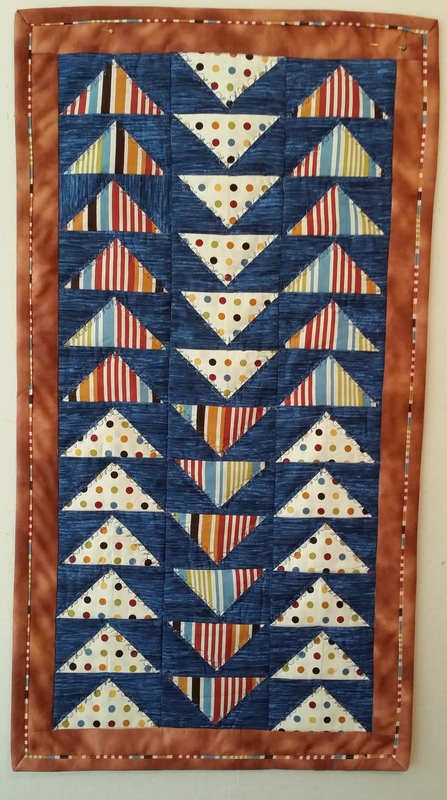 (Still a UFO…more quilting to do). November started with a guild class “wonderful watercolors” (another UFO) and a visit from my sister. I gave her 3 pillows for her birthday (LOG CABIN). When she got home at the end of the month, her quilt was waiting for her! It was also National Model Railroad Month; so hubby and I did lots of model train activities together, visiting train shows; and various layouts in Pennsylvania. I also spent the month promoting the Delmarva Model Railroad Club Open houses. I spent Thanksgiving weekend selling raffle tickets at the club to help out. And of course, started the Grand Illusion Mystery Quilt. I also got very excited about finding panels for the MODA FLATS Dolls. December started with another Model Railroad Open; and the “finish the gifts” rush. Only previous photo’s here; as that box hasn’t arrive in Congo; so I won’t spoil the surprises. I of course have been working on the Grand Illusion and have been blogging along all month about that. So; check the recent posts for photos. And, lastly; my hexi project. I started doing English Paper piecing Hexi’s (1″) in December last year, just to fill time in the evening. Well; I have made a few, and now am starting to think about what I will do with them NEXT year! Time to come up with a pattern! Well…the decision is final…it WILL be C E L E B R A T E….and on the flip side…since I am making it…it WILL be H A P P Y B I R T H D A Y ..
Got all the stitching done for the Celebrate, and have all my letters cut out for Happy Birthday. Of course, today, when I was tracing the letters, I forgot to flip the B & the P and the R…and had to “re-do” them to a mirror image….I was going high speed…and was more worried about which colors I was using for which letters…. Nothing like a minor glitch. Was glad I only goofed up 3 letters, as my supply of wonder-under is almost gone. I still need to cut some more interfacing to go behind the H.B. triangles. The quilters cotton is just to flimsy with out the interfacing on the front and back triangles. Did the “c” and got it turned easily with the interfacing on both pieces. I left the top of the triangle open for turning. It will get enclosed in the tie fabric anyway. 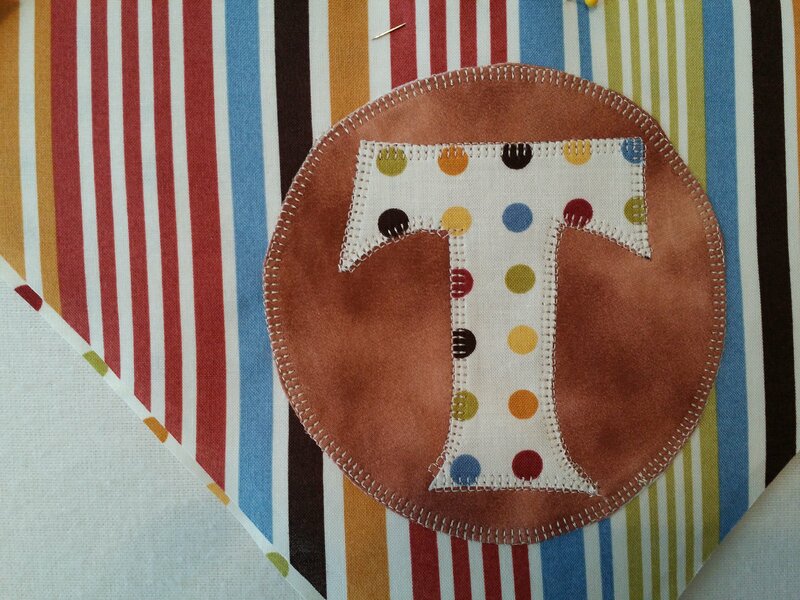 Had to make myself a little “diagram” so I don’t sew the wrong letters back to back…. I am also alternating the fabrics; polka dot and stripes to make it more interesting. Here is a quick peak at an early stage this afternoon. If you zoomed in the T you will see I had some trouble making the corners turn. I got better as I went along. 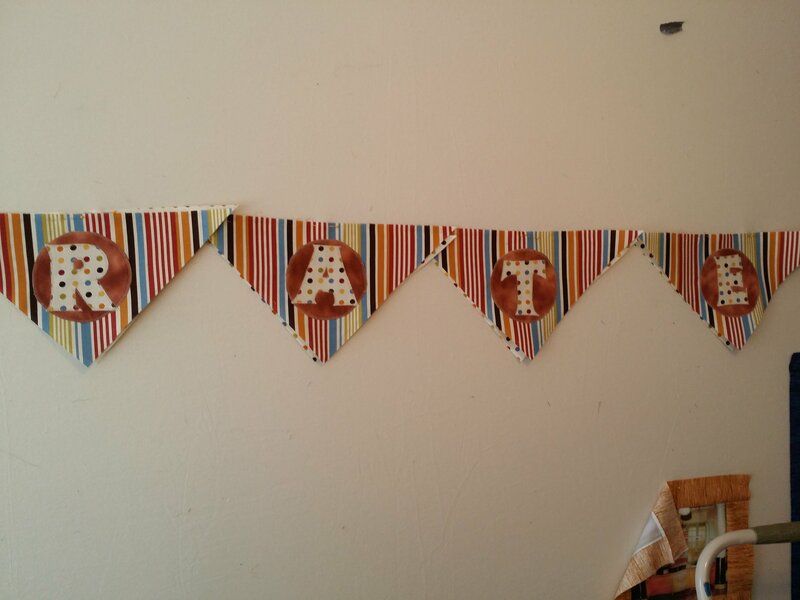 So, my darling daughter, when she recieves this bunting, will know that it is NOT perfect, like me. But it is done with love, and I am learning as I go. And of course, now that I have done this, I have read a blog post with tips and techniques from Wendy Sheppherd’s blog : Ivory Spring — http://ivoryspring.wordpress.com/2011/03/02/tell-all-applique-tips/ Love the information she presents and the techniques! !